I haven’t shown you my study in awhile, so I thought I would give you a peak in here today. My computer was giving me the dreaded blue screen, so I ordered a new computer and bought a larger monitor. I actually got my computer working with a refresh and that’s when I realized the root cause was that it had run out of space. So I quickly cancelled the order for a new computer, but by then I was in love with the new monitor, so I kept it. (I had purchased them separately.) I got my tech guy to add another drive to my computer and *boom* I was back in business. The monitor may not look that big in the photo, but it’s a 32 inch screen. Below you can see the two screens I was using previously. So the big monitor might not be a ‘fashion statement’ for the room, but practically speaking, I love being able to really see what I’m working on. If you want to know which monitor I got, here’s the affiliate link CLICK HERE. It has a curved screen, which is nice. I actually prefer the blue chairs in here, but in person, they were kinda in the way, and I love where I moved them to in the living room, CLICK HERE. So these smaller French chairs have been moved back into the study. (I had them in here a few years ago.) I’ve added a chartreuse throw and a blue and white pillow to the chairs. I also moved this pedestal in here from the guest room. The furniture isn’t new, but it’s fun moving it around for a fresh look. I am so excited that I’ve got my filing under control, and my office looks like this every day now. (It was under a pile of papers before.) There’s still a pile in here that I won’t show you, but that pile is not mine, and I’ll get in trouble if I ‘clean it up.’ My family doesn’t appreciate my de-cluttering if it involves their stuff. Know the feeling? I keep making space in my bookshelves, but then they get cluttered again. Oh well. The monitor was a nice gift I gave myself, but the clean desk is an even bigger gift. Hi Anita, what a beautiful office space! Thank you for sharing. I am in the process of redoing our home office and i’m Looking for desk chairs. I love yours! Can you share where it is from? Thank you! The desk chair is one I’ve had for over 20 years, and I don’t remember where I got it. The guest chairs are antiques that I have had reupholstered. Thanks for the update on your study/office. I like these chairs in here. I love the rug. I also like the rug in the ad picture showing the heart pillow with pink initials. Can you give the source for both rugs? 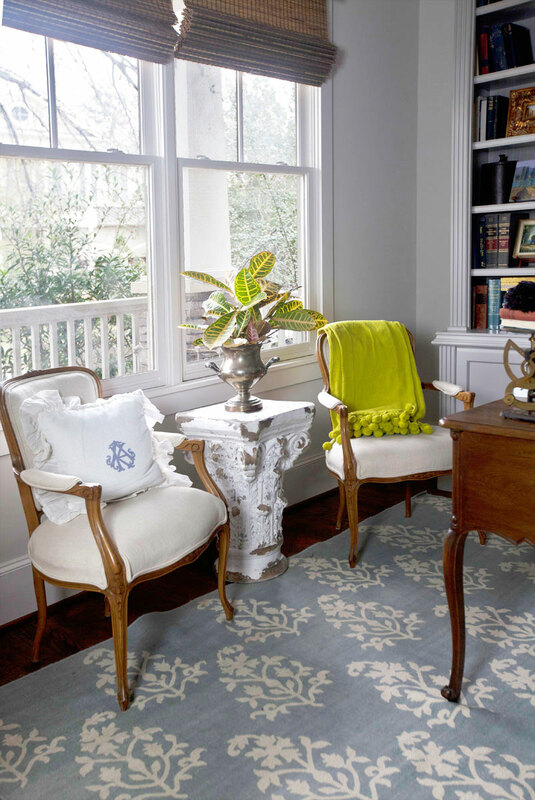 The rug in my office is from Ballard Designs, but was discontinued years ago. The other rug can be found at this affiliate link CLICK HERE. It’s beautiful. I love the area rug. Is it one of your designs? If not, where did you get it. Anita, You have a lovely workspace. It is calming, feminine, and graceful. Thank you for sharing! From Ballard Designs years ago on clearance. They don’t have it any more. I loved seeing your study Anita. It is similar to the small one in our home, only we had to give our lovely bookcase to our daughter, who needed it more ! My husband works in IT and luckily, his laptop is hidden away ! A beautiful study. Thanks Angie!!! A laptop looks even better! Love the French Study updates! 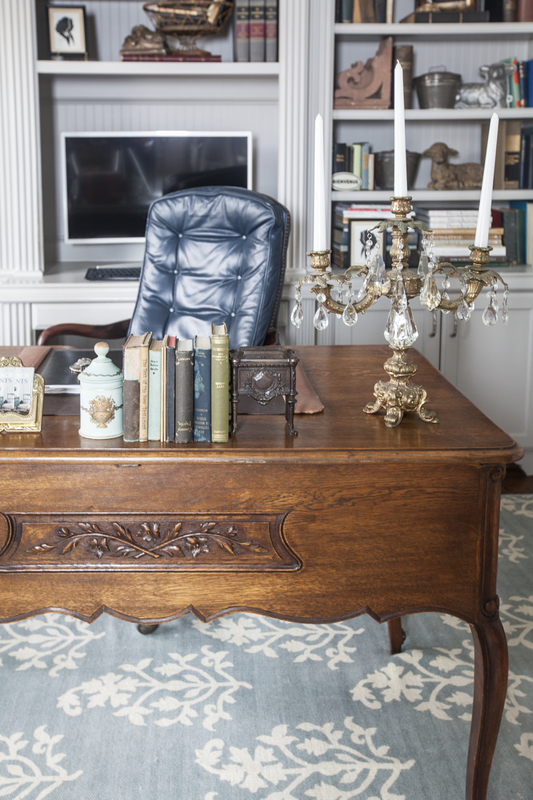 I agree, moving furniture pieces from one area to another gives a refreshed look for no co$t! A clean desk? Not since I share a Home Office with “Mr. Ed”. What a beautiful office. So comfortable looking. Noticed your roman shades. Are you happy with them? My living room and dining room are adjoined. Windows are all on one wall…with the DR having a patio door. I eliminated my heavier window treatments several years ago when we put in hardwood floors. I still do not have window treatments and struggle with what to do. I thought about roman shades. 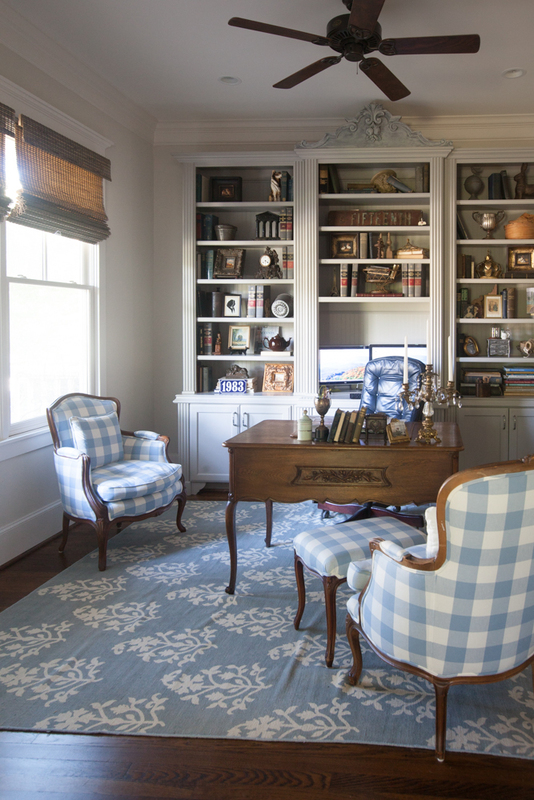 My casegoods are all french country…upholstery is neutral sofa and two beautiful paisley blue print chairs.